Inventory We are a resale marketplace, not a box office or venue. Ticket prices may exceed face value. This site is not owned by Jacobs Pavilion . 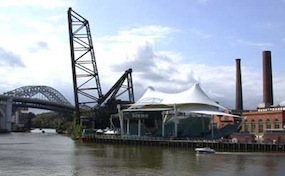 The Jacobs Pavilion at Nautica has been bringing great summer concerts to the Cleveland metro area since it's opening in 1987. The amphitheater has been through many names since opening commonly referred to now as the Nautica Pavilion. The Jacobs Pavilion box office is located at 1231 Main Avenue in Cleveland, Ohio. The venue is only open for the summer concert series and will generally have over 15 shows. Some of the most popular Nautica Pavilion tickets recently have included bands like the Black Keys, Bad Religion, Janet Jackson, Bob Dylan and O.A.R. Every seat is a good seat at the 5,000 plus seating capacity amphitheater. Jacobs.PavilionCleveland.com is not in any way affiliated with any primary box office, venue, or official website. We are an independently owned and operated company that specializes in all events in the secondary ticket market. Prices on our sites may be below or above face value and can change quickly with demand. To order tickets to all Jacobs Pavilion at Nautica events please follow the steps through checkout online or pick up the phone and call our operators at anytime.